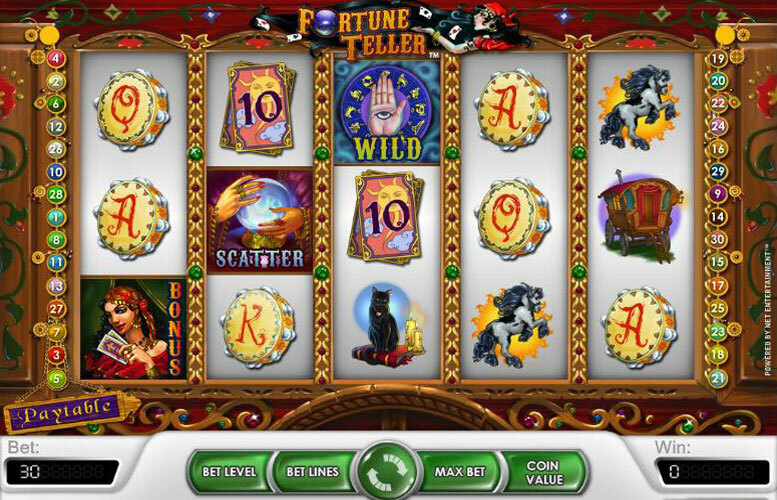 Fortune Teller is a mystical themed online slot game with a top jackpot prize of 65,000. You can bag that jackpot with just one spin of the reels or trigger free spins thanks to the two scatters which also yield very tasty payouts! Fortune teller has 30 pay lines across 5 reels, which is pretty good for a game that doesn’t allow coin value to go higher than 0.50. It’s based on mystical theme and all graphics come from what looks like the inside of a Fortune Teller’s shop or tent. One big plus is that you can bet max more cheaply than most machines, due to the coin value and there’s plenty of ways to win and special features. There’s wild and scatter symbols which help boost winnings and there’s a bonus game in which you pick cards from the Fortune Teller’s deck to reveal different payouts which are then displayed to the left in the crystal ball. This is triggered by the fortune teller herself and is well worth looking out for. The maximum jackpot for this game is 65,000 credits which will vary in worth depending on your betting level. This is not an especially high payout, but the betting for this slot machine is low so it is not expected to pay a large amount. The bonus rounds allow you to accumulate additional winnings and free spins to increase your profit by a significant amount when you play. To earn a better chance at winning the maximum jackpot you will want to bet enough to enable all 30 pay lines. 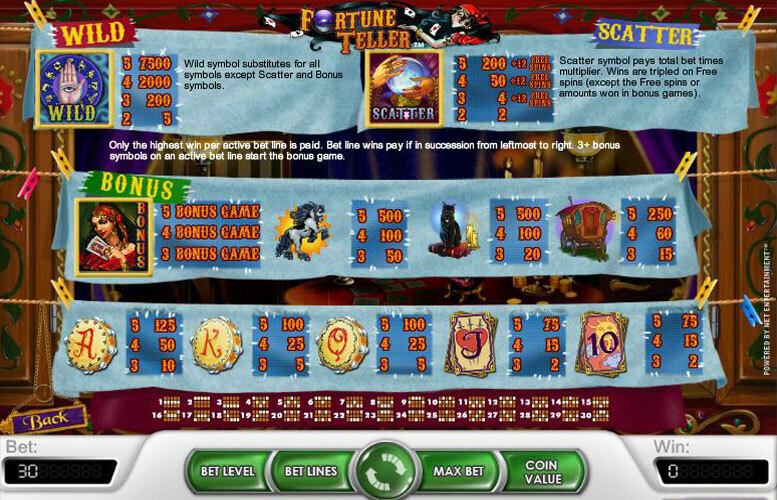 Betting limits for Fortune Teller slots game start at 0.01 and increase to 0.50 for coin vlaue. You can bet a maximum of 4 coins per line with every spin and enable up to 30 pay lines every time you play. In order to be eligible for the largest in-game jackpot you will need to bet at the highest coin level, as the value of coins is directly tied to your betting level. There is a bonus level within the game that will allow you to win up to 65,232 if you manage to get high rolls in all of your free spins. The value of these credits will also depend on your betting level at the time, so it is still necessary to stay at the highest level to earn the maximum prize. Palm Reading – This is one of the wilds for the game. You can use it to replace any symbol on the board except for the Fortune Teller and crystal ball. You can also not use this wild to enable the Tarot card game. Fortune Teller – This is a scatter symbol which will allow you to rearrange the other symbols on the board to earn higher prizes. It is the only icon on the board that will give you a prize for matching two of a kind. It does not need to appear on an enabled pay line to be effective. If you earn three or more fortune tellers you will enable the Tarot card feature game. A new screen will pop up and you will be asked to click on different Tarot cards to win prizes. As soon as you select the death card the game is over and you return to regular play. Matching 5 of these will earn you the maximum jackpot. Crystal Ball – The crystal ball is another scatter card that can be enabled during regular play. When three or more appear on the board you can start the free spin bonus game. You will get 12 free spins. At this time the controls will be disabled and you will earn prizes based on the results of each spin. Horse – This is a regular symbol which can earn you 50 coins for a match of three, 100 coins for a match of four and 500 coins for a match of five. Black Cat – The cat is a regular symbol that can be enabled during regular play. Each match of three will earn you 20 coins, four will earn 100 and five will earn 500. Wagon – Another symbol in regular play, the wagon earns 15 coins for a match of three, 60 coins for a match of four and 250 coins for a match of five. Cards – Cards starting at 10 and going through Ace are available on all of the reels during regular play. The Ace is worth 10, 15 or 125 coins depending on the match. Kings and queens earn 5, 25 and 100. Jacks and tens earn 2, 15 and 75 for matches of three, four and five. This game has a rating of 2 / 5 with 188 total reviews by the users.